The discounted price will be applied based on the quantity below. Melolin consists of a highly absorbent cotton and polyester fibre pad with a hydrophobic backing layer which is heat bonded on one side to a very thin perforated polyester film. 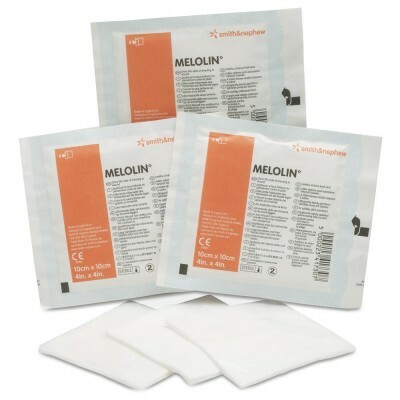 Benefits Melolin has a low adherent perforated film which allows for rapid drainage of any fluid that may leak from the wound, thereby reducing trauma to healing tissue. The highly absorbent cotton/polyester pad provides patient comfort and minimises pain on removal. Melolin is easily cut to shape and retains its integrity when cut. It provides a significant improvement in terms of strike-through and, therefore, fewer dressing changes will be required. Melolin is suitable for post-operative and casualty use, in particular for light to moderately exuding wounds including clean and sutured wounds, abrasions, lacerations, and minor burns. The film side of the dressing is placed next to the wound. Melolin consists of a highly absorbent cotton and polyester fibre pad with a hydrophobic backing layer which is heat-bonded on one side to a very thin perforated polyester film. The film side of the dressing is placed next to the wound. What can I use Melolin for? Melolin is suitable for post-operative and casualty use, in particular for light to moderately exuding wounds including clean and sutured wounds, abrasions, lacerations, and minor burns. Why should I use Melolin on my wound? Because Melolin has a low adherent perforated film which allows rapid drainage of fluid from the wound, thereby reducing trauma to healing tissue. The highly absorbent cotton/polyester pad provides patient comfort and minimises pain on removal. Melolin is easily cut to shape and retains its integrity when cut. It provides a significant improvement in terms of strike-through and, therefore, fewer dressing changes will be required.